To stay with the cute felines of my before-last contribution: this is what happens when they're having a ball with mommy's knitting. Not in the picture is the Ariadne-like labyrinth of two balls of wool spun skillfully around furniture and bannister throughout the house, with both colours nicely interwoven, of course, and one of the culprits each killing the deathly foe with great enthusiasm. Even worse, this is happening he second time now - the first time it was just the multicoloured wool of the first part, and it took me nearly four hours to untangle it. Of course I had put my knitting well away since then - or at least I thought I did. Now I know my adept little girl is also able to undo the double knot of the handles of the cotton bag where I keep my knitting in. And most astonishingly, they managed to not lose a single needle or stitch on both times. You need a knitting apron - one with an enormous kangaroo pocket so you can put wool and work into it if you are leaving the room, and take it with you! Sort of like this, only adult sized. I already tried a small, light cardboard box with lid, but that's too easy to open. Now I'm actually thinking of these. I want to get them anyway for my knitting wool stock (which is rather sizeable due to some unfinished projects of old *cough* ), because we have a recurrent problem with small wool-eating moths, and stowing sweaters in the larger variant works well. As it has a zipper and comes in shoe-box size, and, I think, has also a handle, it might work. 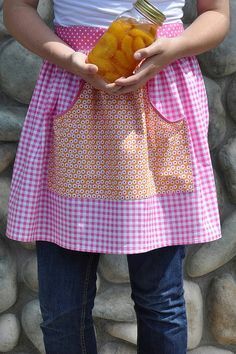 But I might actually sew me an apron like this, too. I have a 'pattern' for an apron with a kangaroo pocket- basically cut a strip of fabric the width you want the bottom to be, and twice as long as you want the apron to be. Then cut two 'curves' at one end and bind them, before folding it in half so the fold is the bottom of the apron, and the bit with the two scoops out of it, and the straight end, form the waist end. Gather these two together and put a waist band that also forms the ties. This way the pocket is almost the entire size of the apron. I'm afraid not entirely, but I'm notoriously bad at following such instructions even in German. Could you perhaps make me a drawing how the result should look? I think I'd be able to figure it out then. I'll draw it, scan it, and e-mail it to you. It will be easier than trying to do it on the computer! The deathly foe, oh dear! It's a precarious life for yarn in your household. Naughty kitties! I dread to think what mischief Harry would have got up to if I knit! They're the first to be so fascinated - and it's mostly Findis, her brothers are just joining in. Smilla loved to chew my bamboo knitting needles, but that was that. Oh dear. Clever response to the prompt, though.